First, I go everywhere by bicycle, which means speed limits and London congestion are of very little relevance to my journey times. But I noticed that journey planners like CloudMade’s offer wildly optimistic journey times for cars. Even ignoring congestion, I thought, they can’t be taking account of speed limits, which across London are lower than the national assumptions. For example, most main roads have a 30 mph speed limit and a growing number of roads, residential and main, have a safer 20 mph limit. The second reason is that speed limits have been a big issue for cyclists recently, featuring in campaigns around issues like Blackfriars Bridge and Southwark’s Transport Strategy. Orange roads are 30 mph, green are 20 mph or lower, grey are main roads without any data; all the minor roads without speed limit data just show through from the background. Getting more roads down to 20 mph will make them much calmer, more pleasant and safer for people on foot and bike. Not a bad start, but we have a long way to go! I could probably get data out of TfL and Southwark Council. But I’m interested in seeing what I can actually find on the ground, both because the two sometimes don’t match up and because it made me aware of just how varied the signposting is. With some roads it’s very obvious – it’s a short residential road with a signpost and a huge “20 mph” painted onto the road. On other roads you could easily miss it. 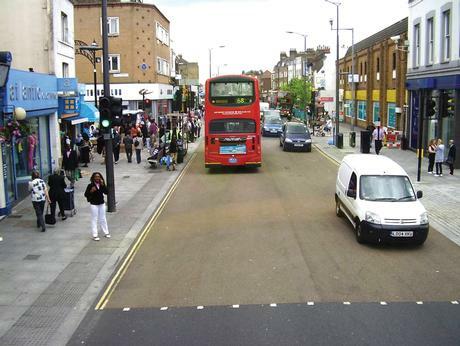 Walworth Road has a 20 mph limit, but if you missed the single signpost going either north or south past endless distracting shops, signposts and shoppers, and buses that often block your view, you could be forgiven for assuming it’s 30 mph like most other roads. Back to OpenStreetMap, it would be good to get better coverage of speed limits. I notice that some parts of the country like Norwich are very well mapped, while London – with the exception of my experiment, Islington and a little bit of Tower Hamlets – barely has any. Even as a cyclist, tagging speed limits is useful. Cue http://www.cyclestreets.net/ which, I would guess, takes speed limits into account when distinguishing quiet/normal/busy itineraries for bikes. Yes, I checked with the CycleStreets people, Martin told me the same thing. Having the ITO map to highlight the data gaps and uses of the data such as CycleStreets will hopefully encourage wider tagging. Good work in Kent, by the way! Speed limits are also handy for avoiding cycleways with rediculously low speed limits (there’s a couple in Victoria that combined with the angle of the hill are just impossible without dismounting, something that’s not obvious until you’re right up on it and won’t realize until it’s too late while clipped in to the pedals). I wish JOSM highlighted MPH speed limits on 5 MPH increments instead of only the 10s. This is annoying because in Oregon, the default speed limits are 15, 20, 25, 30, 45, 55, 60 and 65.